The Return and Exchange Policy only applies to online purchases made on Shopatimage.com. Purchases made on Shopatimage.com will have 14 days from the day the item is received to make returns for a full refund. Returns made after 14 days will be given store credit only and charged a 30% restocking fee. Returns will not be accepted after 30 days. All returned items must be unworn, unwashed merchandise with the original tags attached. Final sale merchandise includes Sale items, accessories, jewelry and intimates. Items that do not meet these criteria or are non-returnable will be denied and shipped back to sender. We will gladly exchange or give store credit if the items received have manufacturer defects, damages or are incorrect. Customers are responsible for paying for return shipping and return shipping is non-refundable. 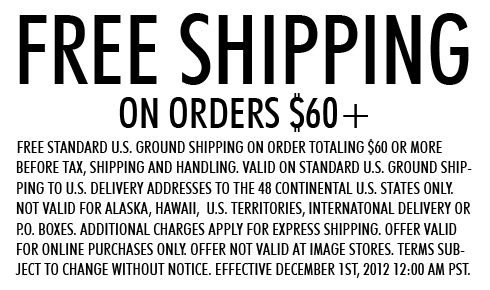 In the case of defective or incorrect items, Shopatimage.com will refund the cost of return shipping. Refunds will be credited to the original form of payment. Please allow 2-3 weeks from the return shipped date for your account to be credited, and 1-2 billing cycles for the credit to appear on your statement. Merchandise purchased online at Shopatimage.com cannot be exchanged or returned at Image stores. For returns or exchanges, online purchases must be shipped back to the Shopatimage.com warehouse. For all returns, please fill out the Return Form included in the shipment and include it in your return package.